Kang Hye-jung is a South Korean actress. This biography profiles her childhood, family, personal life, career, achievements and some interesting facts. Kang Hye-jung is a South Korean actress known for her performances in films like ‘Love Phobia’ and ‘Girlfriends’. Kang started her career with modelling and later went on to venture into films, starting from 2000’s ‘Flush’. She then gained wide recognition through her second film ‘Nabi’. From there she went on to play key roles in films and TV dramas in order to become one of the most popular South Korean actresses. While ‘Oldboy’, the film which went on to achieve international success, remains her biggest claim to fame, she bagged many awards for her other films as well. She won the Best Actress Award for her films ‘Herb’ and ‘Rules of Dating’. Simultaneously, she received several awards and nominations for her TV dramas as well. She also appears in music videos from time to time and keeps herself open to new challenges. Some of the music videos she was part of include ‘Lonely Street Lights’, ‘I Loved You to Death’ and ‘As I Look into the Mirror.’ She also makes sure to avoid facing typecast issues by selecting her roles diligently. Kang Hye-jung was born in Incheon, South Korea on 4th January 1982. Always interested in treading the less taken path, she knew where her destiny resided. She never let go her dream of being in the show business even after many stressful confrontations with her parents. She started participating in theatres in her middle school and from then onwards she kept honing her skills in order to prepare herself for a career in the film industry. She started modelling during her high school days and by the second year she was already being featured in many commercials and magazines. She even appeared in the music video of the song ‘Time’, while in her high school and this, along with many of her earlier stints, helped her to gain an insight into her profession and the way the industry worked. After completing her education, she moved to Seoul and got enrolled in the Seoul Institute of Arts, in order to get professional training in the performing arts and studied theatre there. But by the time she got her bachelor’s degree; she had already started her career. She started her career with many small roles in sitcoms such as ‘Jump’ and ‘NonStop 3’ and also did a short film titled ‘Flush’ in the year 2000. It was the beginning phase of her career, and she was still pretty young and naive. Her adorable looks helped her in bagging some small roles, but she eventually proved her acting prowess in the smaller roles that she got. 2001’s low budget science fiction film ‘Nabi’ became the launching vehicle for her future career and she was noticed by one of the most prolific filmmakers of South Korea, ParkChan-wook, who then offered her a key role in the film ‘Oldboy’. She won the Best Actress Award at the Bucheon International Fantastic Film Festival and that also played a major role in her grabbing the eyeballs of director Park, who himself was just a beginner at that time. ‘Oldboy’ came in the year 2002 and Kang played the female lead role of Mi-do in the film. Her character falls in love with a total stranger, and helps him in looking out for the man who imprisoned him 15 years ago. The film, now considered a modern classic, was a big hit, both domestically and abroad, and brought Kang a fantastic exposure. She ended up winning honours at the Grand Bell Awards and Busan Film Critics Association for her performance as a vulnerable young girl. 2005 was the busiest and the most successful year of her professional life as she appeared in five back-to-back films. One of them included the third part of the famous vengeance trilogy by director Park Chan-wook. In 2005, she finally started coming out of the ‘Oldboy’ phase and starred in a relationship drama titled ‘Rules of Dating’. The small time film wasn’t expected to do well at the box office, but surprisingly, the film became a hit. ‘Welcome to Dongmakgol’ was also released in the same year, and although she had a very small role in the film, she received accolades from all around, and the film went on to become one of the highest grossing films that year. A survey conducted in 2005 revealed that she was in fact the most bankable film star in those times. In 2007, she continued with meatier roles and starred in ‘Herb’, in which she played a specially challenged girl. For her role, she was nominated for the Best Actress Award at that year’s Korean Film Awards. In pursuit of a change in image, she then focused on doing romantic comedies and appeared in ‘Why Did You Come to My House?’ in 2009 and then she played the leading role of a depressed woman in ‘Kiss Me, Kill Me’. In the film, her character hires an assassin to kill someone after she fails to do so, but the killer falls in love with her. In the meantime, she also kept appearing on the small screen every now and then, and played some key parts in series such as ‘On Air’, ‘Nonstop3’ and ‘Miss Ripley’. In 2010, she appeared in the first English film of her career in the form of ‘Wedding Palace’. She played the lead role in the film and the film went on to become a critical success, and a moderate commercial success. The film eventually went on to be premiered at the Los Angeles Asian Pacific Film Festival and won awards at the 2011 Cine Gear Expo. She then appeared in the romantic comedy TV series ‘The Wedding Scheme’. In the following year, she played an extended role as herself in the reality show ‘The Return of Superman’. In 2014, she appeared in a comedy family drama ‘How to Steal a Dog’ and in the same year she had a stint with theatre in the form of the play ‘Educating Rita’. In it, she played the role of Susan, an English literature student. She also had a stint with song-writing as she got credited with penning the lyrics of the song ‘Good Thing’ for Bobby Kim. She also featured in a mockumentary titled ‘Behind the Camera’. In 2017, she was seen in the science fiction thriller ‘Lucid Dream’, which also happened to have a worldwide premier through Netflix, a digital video streaming platform. She is looking forward to the release of two more of her films in 2017, titled ‘My Wife’ and ‘The Man only I can See’. 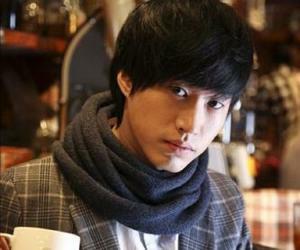 Kang Hye-jung met musician Tablo during one of his concerts. After dating for quite some time, the couple got married in October 2009. By the time of their marriage, Kang was already three months pregnant, and gave birth to a daughter named Haru in October 2010. The couple is also known as one of the most high profile couples in the South Korean show business. She also happens to be one of the very few South Korean actresses who have admitted to have undergone a plastic surgery to enhance her looks.